kit, the Elise S Cup R showcases the marriage of form and function perfectly so that performance is optimized yet retains its stylish and iconic aesthetic. Performance is enhanced over the road-going Elise S due to a motorsport-specific engine control module (ECM) and a computational fluid dynamics (CFD) proven aero pack comprising; front splitter, barge boards, winglets, rear diffuser, floor extensions and rear wing. Despite the extra body kit and race-ready additions, Lotus Motorsport manages to maintain the road car's light weight of just 2,037 lbs. These modifications and the clever manipulation of air-flow to create extra down force, combined with adjustable dampers and springs, reduces lap times by 4 seconds on a 3.1 mile track over the standard Elise S.
The Lotus Elise S Cup R is eligible for entry to the production class in the 2014 Lotus Cup series which operates under the banners Lotus Cup UK, Lotus Cup Europe, Lotus Cup Italia, Lotus Cup USA, Lotus Cup Japan, Lotus Cup Thailand, Lotus Cup China and Lotus Ladies Cup. 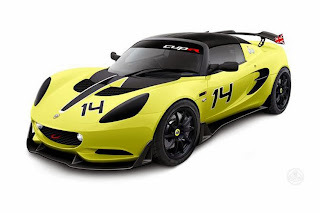 The Lotus Cup is open to all Lotus owners and their Elise, Exige, Evora, 340R and 2-Eleven vehicles. To make a statement on some of the best tracks in the world, the Elise S Cup R has a selection of bespoke color and trim options courtesy of the Lotus Design team.